It's hard to believe that 40 years ago this week JAWS premeired in theatres. With it the summer blockbuster was born and also the beginning of a new era of ocean awareness. There are many communities that will be showing JAWS throughout the summer and generations of families will gather to enjoy it. It's staying power is a tribute to director Steven Speilberg's masterful job of bringing Peter's fictional novel to life. While JAWS scared some people, it mesmerized others. 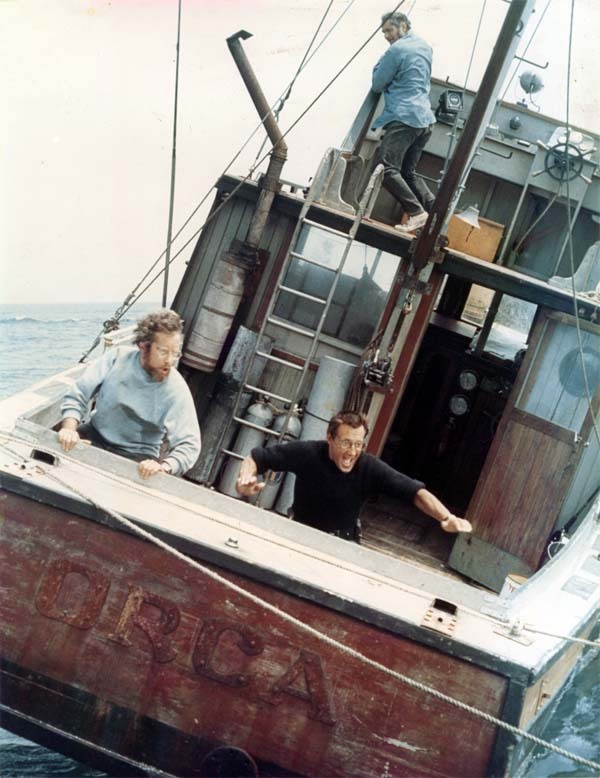 So much so that they would go on to study the ocean and commit their lifes work to being real life Matt Hooper's in the field of ichthyology and other marine sciences. Following the release of JAWS, Peter and I traveled and dived in nearly all of the world's oceans where we witnessed dramatic changes to our ocean’s wildlife and habitats on expeditions that included work on documentary films, articles, and television shows for National Geographic, ABC’s American Sportsman, The New England Aquarium, and many others. Today, I sit of the Board of WildAid, a great organization solely dedicated to stopping the traficking of and demand for llegal wildlife, including shark fin, rhino horn, ivory and tiger. WildAid has sounded the alarm on the devastating impacts of shark finning to shark populations. Their highly successful public awareness campaign to reduce consumption of shark fin soup in China, Hong Kong and across Asia has helped change attitudes about sharks about why we need them swimming in our seas and not in our soup. The results of these efforts have helped reduce demand for shark fin by more than 50 percent. We have more work to do, but progress like this makes me hopeful that the positive impact of JAWS will live on for decades - bringing more people into our blue community to protect our oceans at every level. Last week I had the great pleasure to speak at the New England Aquarium's IMAX Theater at an event hosted by Women Working for Oceans (W2O). We celebrated Massachusetts joining eight other states that have enacted legislation to ban shark finning. They asked me to address the myths that have grown up around sharks and "Jaws." I led with my most important observation, which is that over the past forty years attitudes have changed greatly and support for protecting sharks is gaining momentum. 1) How Jaws changed ocean awareness and helped create a new generation of marine scientists. While the media has continually sensationalized the fear of sharks, the movie has become a multi-generational viewing experience where grandparents, parents and children watch together and discuss ocean issues. 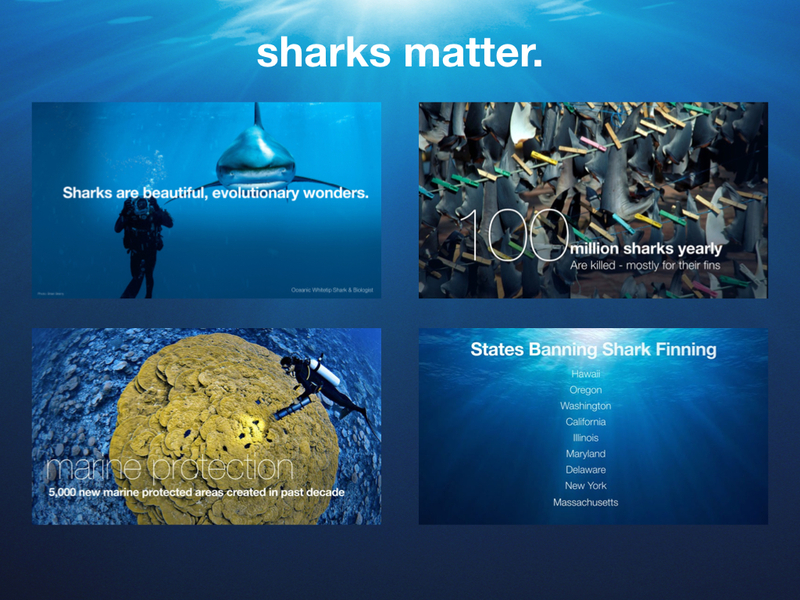 2) Why sharks are evolutionary wonders, their importance to the health of our oceans, and how much we have learned about sharks through research and new technologies. 4) Ocean conservation is now a global priority. Marine protected areas are one of the most effective ocean conservation tools we have. I was thrilled to be invited to take part this summer in Secretary of State Kerry's "Our Ocean" Conference. Over two days hundreds of marine conservation initiatives and new ideas were exchanged, including President Obama's declaration to expand the Pacific Remote Islands National Marine Monument from almost 87,000 square miles to more than 490,000 square miles. 5) The Ocean is not political. It’s ours. It’s everyone’s. Taking action and coming together in a bipartisan way to craft legislation at every level — local, state, national and international—to protect our seas has been the focus of my efforts for more than four decades. This gives me hope. 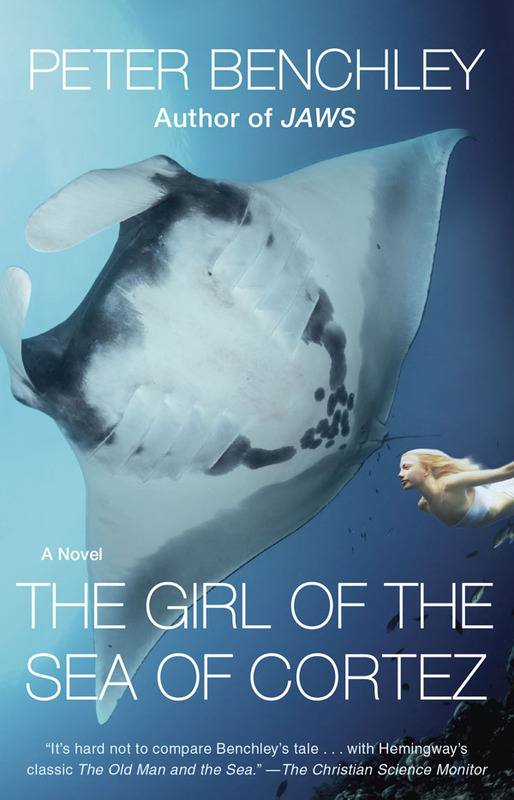 Thirty years ago Peter took a wonderfully strange ride in the deep – a once-in-a-lifetime ride on the back of a giant manta ray that would compel him to write this, his favorite novel, The Girl of the Sea of Cortez. Peter was filming an American Sportsman segment on the huge schools of hammerhead sharks that used to gather periodically in the Gulf of California, also known as the Sea of Cortez, but the majestic manta ultimately became the center of their cinematic attention and affection. In truth, manta rays are like floating islands, oasis sanctuaries that host a myriad of animals seeking shelter, protection and sustenance from these grand giants. But they are very shy and almost never permit human contact. This magical encounter gave Peter the idea for an adventurous and poignant story about the tension between humanity’s ever-growing need for food and the enormous pressure that overfishing and coastal development are are putting on our oceans and its amazing creatures. The fate of these beautiful mantas is in serious jeopardy. Because of their particular anatomy and the fact that mantas can’t swim backwards, they are prone to getting entangled in fishing lines and nets. As a result, they often turn up as incidental fishing "by-catch" or, worse, they are deliberately hunted down by frustrated fisherman who have lost too many nets. In the past five years there has been an alarming rise in the use of manta gill-rakers for Chinese medicine, which is devastating manta populations globally and putting them at risk of extinction. On May 15th we honored eight heroes in national stewardship, science, policy, media, grassroots activism and the promise of youth to offer us solutions and hope. The Peter Benchley Ocean Awards are the world’s preeminent ocean awards and are unique in acknowledging outstanding achievement across many sectors of society leading to the protection of our ocean, coasts and the communities that depend on them. The awards celebrate Peter's legacy as someone who spent more than 40 years educating the public and expanding awareness of the importance of protecting sharks and ocean ecosystems. In honoring President Macky Sall of Senegal this year we are honoring a third national leader following President Laura Chinchilla of Costa Rica and President Anote Tong of Kiribati. These ocean heroes have come from Latin America, Oceana and Africa and reflect both a great challenge and a great hope. The challenge is the devastating impacts of overfishing for the global seafood market, oil, plastic, chemical and nutrient pollution, loss of habitat to coastal sprawl and the global impacts of climate change. 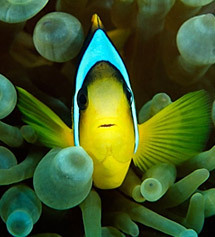 The hope is that nations like Costa Rica, Kiribati and Senegal in taking actions to restore and protect their seas can also inspire larger nations such as China, India, Brazil and the United States to enact strong policies and promote global initiatives for the betterment of our last great commons and blue frontier. Certainly saving our seas and the people who depend on them (all of us) will require the imagination and boldness that we recognize in this year's Benchley winners. It will take the calculated risk of the explorer, the dedicated focus of the scientist, the practical statecraft of the policymaker, the communicative skills of the media worker, the impassioned idealism of youth and the inspirational leadership of both presidents and grassroots activists. What do a West African President, a pair of scientists studying life in the ocean, a twenty-year-old veteran of 4-H clubs, a Massachusetts Congressman, and two California women who spent over a decade working to create underwater parks have in common? They are among the winners of this year’s, sixth annual Peter Benchley Ocean Awards. The Benchleys are the only awards program dedicated to recognizing excellence in ocean conservation solutions across a wide range of categories including science, policy, media, youth and citizen activism. The awards celebrate exceptional efforts leading to the protection of our ocean, coasts and the communities that depend on them. This year’s winners were selected from among dozens of highly qualified candidates whose names were submitted to the selection committee. The awards will be presented on May 15, 2013 in Washington, D.C. during Blue Vision Summit 4. As one of his first acts after his election in 2012 President Sall rescinded all foreign fishing permits in his nation’s Exclusive Economic Zone. Within months of his action thousands of local fishermen were seeing their catches dramatically increased and their families and communities restored. President Sall is now moving forward with plans to assure a sustainable domestic fishery free of foreign exploitation, creating a resource management model for West Africa and the world. Working both separately and in collaboration this husband and wife team of scientists from Dalhousie University in Canada have continued to expand on the work of the late Ransom Meyer, the first Benchley science award winner. Through their extensive body of work they have significantly increased the world’s knowledge about the changing abundance and diversity of the planet’s fish and marine wildlife populations and the impact of nutrient pollution and other human activities. Representative Markey (D-MA) has a strong record of support for the oceans including as a critic of offshore drilling and outspoken critic of BP during its oil blowout in the Gulf of Mexico in 2010. He has promoted legislation to address climate change and ocean acidification, supports sustainable fishing policy and, as the ranking member of the House Natural Resources Committee has been a strong defender of National Ocean Policy, the Clean Water Act and other environmental protections. In 1999 leading ocean scientists and communications professionals established COMPASS to train marine scientists in communications skills needed to talk to the media, the public and policymakers about their findings. 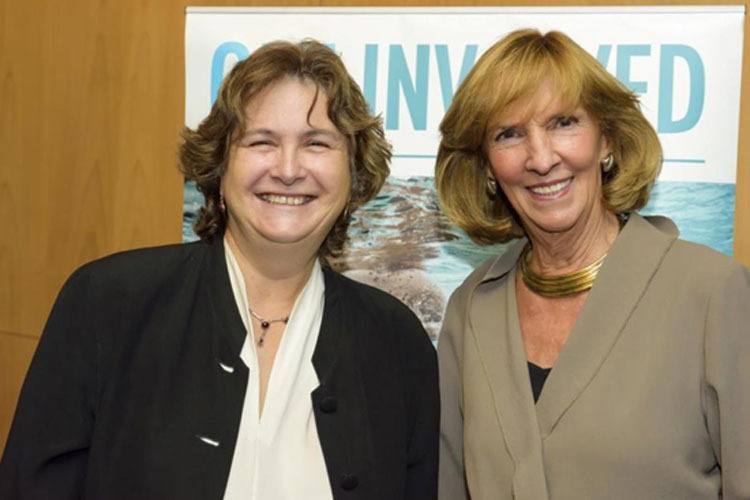 As the long-time Ocean Science Outreach Director for COMPASS Nancy Baron has played a pivotal role in establishing strong links between thousands of scientists and journalists so that changes and discoveries in our seas become news and information we can all use. Twenty-year-old Sean Russell became aware of the problem of marine plastic pollution as a high school intern at Mote Marine Laboratory in Florida. In response he founded the “Stow It-Don’t Throw It” project, a statewide monofilament fishing line recycling program and collaborative effort between youth and environmental groups that has since gone national. In 2011, with the help of Mote Marine Lab, Sean led the first Youth Ocean Conservation Summit held in Florida that inspired the creation of the activist Youth Ocean Conservation Team (YOCT). He has also given countless hours to community service projects while serving as a member of the Florida 4-H Program. Sean is now a senior at the University of Florida. Hopefully hundreds of you will join this year’s winners at the Carnegie Institution in D.C. on the evening of May 15. The awards ceremony will be free and open to the general public. The awards dinner will be a ticketed event and not included in Blue Vision Summit 4 registration. Tickets will go on sale in February. For Peter, writing Jaws was neither the beginning nor the end of his relationship with sharks. Sharks first fascinated him as a child on Nantucket. Shortly after Jaws was published in 1974, Peter and I went diving with great white sharks for the first time in South Australia with ABC's American Sportsman, Stan Waterman and Rodney Fox. And Peter became enamored with sharks in a totally different way. Legacy: The Words of Peter Benchley is a new short video by Shark Savers and 333 Productions that presents the shark conservation message of Peter Benchley – in his own words. For the decades after the release of Jaws, Peter devoted himself to marine conservation, with shark conservation a special concern. Peter was the writer and I was the environmental policy wonk. 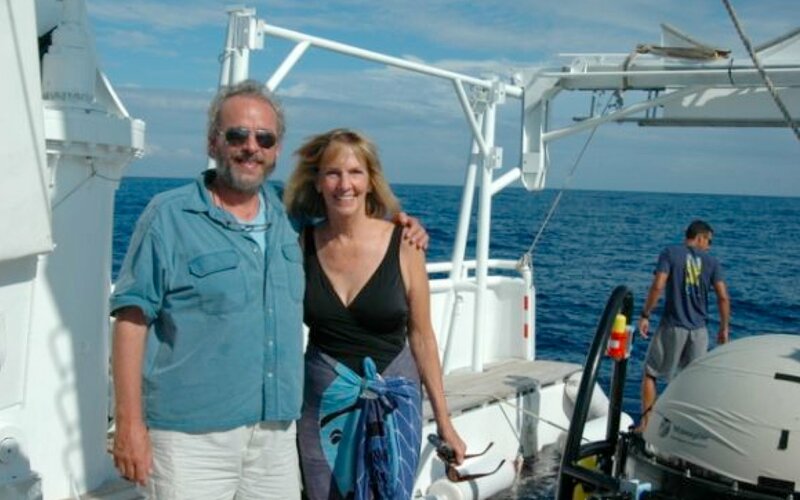 And for more than 30 years we traveled together on shark diving expeditions all over the world. Today, I am Board Chair of Shark Savers, an international non-profit organization whose sole mission is to protect sharks and mantas. Legacy: The Words of Peter Benchley will move the Jaws fan to make the same transition as we did, from mere fascination of sharks, to respect, admiration and a strong desire to protect them. Shark Savers has wanted to prepare a tribute to Peter for some time. In preparation for JawsFest 2012, a fan event that took place in Martha’s Vineyard in August, Shark Savers’ marine conservationist Samantha Whitcraft conceived of the idea to combine Peter's conservation message and eloquent words with the stunning imagery of white sharks filmed by the immensely talented underwater filmmaker, Joe Romeiro. Shark Savers turned to Joe and the fantastic production team led by Bill Fisher at 333 Productions, to produce Legacy with us. The message of Legacy is that we need to protect these important and magnificent animals. 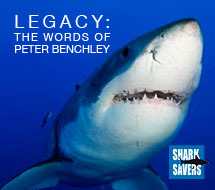 We hope you enjoy Legacy: The Words of Peter Benchley, and please check out all the great work Shark Savers is doing. Less than 100 miles [160 kilometers] off the coast of Florida, Bimini lies low and flat on the horizon. The several islands that make up this Bahamian island chain are studded with palm trees, surrounded by sandy beaches and neatly laid out resort hotels, restaurants and marinas. A notable tourist destination for big-game fishing, this place is famous for once being home to Ernest Hemingway — and it is here that I recently found myself on both a personal and professional odyssey. I first met Peter and Wendy about 32 years ago in Bermuda, under the guidance of a mentor we all shared: the great ocean explorer Teddy Tucker. We immediately kicked off a lifelong friendship based on the solid foundation of our passion for the ocean: they just off the fiery heels of “Jaws” mania, and me with the much lower profile of an oceanographer beginning his career. At first we spent our time together studying whales, exploring the deep sea, night diving on seamounts, finding shipwrecks, and all manner and form of exploring the oceans, which make up over 70 percent of the Earth’s surface and 95 percent of the biosphere. But soon we began to notice fewer fish, bleached corals, pollution and many other symptoms that told us our beloved ocean was dying. The three of us then began focusing our time and careers on ocean conservation. Peter and Wendy began full-time advocacy work, making good use of their public names. I worked the NGO world, first at the New England Aquarium, but eventually running CI’s global marine program. And now here we were in Bimini — site of some of the world’s most cutting-edge shark research — to discuss the legacy of “Jaws.” It has always been my view that while this story undoubtedly scared many people, it also had a positive impact by getting the oceans in people’s minds. It also introduced the world to a charismatic oceanographer figure in the character of Matt Hooper. He was funny, smart, a diver and totally engaged with the oceans; that character helped inspire the careers of myself and other young aspiring oceanographers. I am hard-pressed to meet a colleague who has not been affected by this film. In addition, the public fascination with sharks spurred by “Jaws” helped lead to a dramatic uptick in shark research which has shaped how we understand the ocean today. As Wendy and I swam with these magnificent animals and I watched their interactions with the other reef residents, I saw for myself just how essential they are to all life in the sea and all life on Earth. 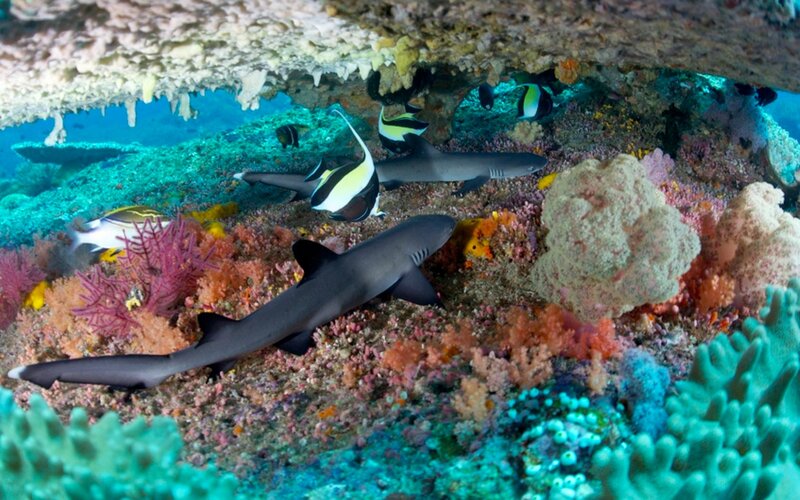 Their removal from an ecosystem can have devastating effects upon the species below, as sharks help to keep these marine systems in balance. The presence of apex predators can lead to greater species diversity and density; in essence, sharks are critical to sustain the fisheries we depend on. Yet despite their importance, around 100 million sharks are killed each year — many to meet the demand for shark fin soup, a cultural delicacy in many Asian countries that often costs as much as US$ 100 per bowl. In addition, sharks are often caught as accidental “bycatch” by commercial fishing nets which are set to catch other species — an extremely wasteful practice. Today, almost 40 years after the release of biggest shark film of all time, the fate of the world’s sharks hangs in the balance. If we are to have any chance at reversing the depletion of these crucial species, we need to both reduce the demand for shark-related products and to work harder to develop and manage improved commercial fishing techniques. It won’t be easy, but as I see global discussions on ocean health gain traction, I’m optimistic that we are beginning to move the needle in the right direction. Greg Stone is CI’s chief ocean scientist. “How ‘Jaws’ Changed the World” airs in the U.S. on Tuesday, 8/14 at 9 p.m. EST. You can celebrate Shark Week by sharing our viral whale shark video with a friend.